How Much Do Tree Services Cost in Stamford? The city of Stamford, Connecticut is just 30 miles from downtown Manhattan and one of the largest corporate and finance headquarters in the United States, but it still retains a more suburban, green feel. This has a lot to do with its tree canopy and location. Use this cost guide to gain a better understanding of the various expenses associated with maintaining any trees found on personal property in the area. Removing an entire tree is typically associated with new construction, but it may also be necessary during a home renovation, home extension or simply because it poses a threat to existing structures. Removing a large tree without professional help is certainly risky, but bringing in professional assistance ensures that the project goes smoothly and the tree comes down without damaging any surrounding property. The average cost is around $688. Removing a stump may be a physically smaller project than removing an entire tree, but professional help is still the ideal route to take and will cost about $112. Large commercial grinders eat away at the stump until it is flush with the ground, which ensures that the area is flat, safe and more attractive in just a matter of minutes. To ensure that any trees located on private property look great, tree maintenance from a professional team may be periodically necessary. Pruning is especially important as an annual task for those property owners that have fruit-bearing trees. Otherwise, tree trimming may be purely aesthetic, or it could be a way to prevent branches from damaging a roof or covering a pathway or sidewalk. Tree owners can expect to pay about $484 for the service. As part of Coastal Connecticut, Stamford’s climate is an in-between area that resembles both the colder continental temperatures in New England and the warmer maritime climate along the seaboard. This combination is ideal for a number of trees, and the area as a whole is a lush, green environment that is incredibly scenic, especially during autumn. Whether homeowners are new to the area or simply ready to upgrade their property, these tips on everything from picking trees to following government guidelines for removal may be helpful. While the City of Stamford, Connecticut does have a number of regulations in place for zoning and construction, they have no guidelines regarding tree removal. This means that as long as a tree is located entirely on private property, it can be altered or removed as desired. Exceptions to this include when the tree is on two neighboring properties or if a portion of the tree is on public land. When removing trees, it is prudent to do so before the first frost of the winter, which hardens the ground and slows down the removal process. Most residents of Stamford receive their electricity through Connecticut Light and Power, which is responsible for maintaining most of the overhead power lines in the area. 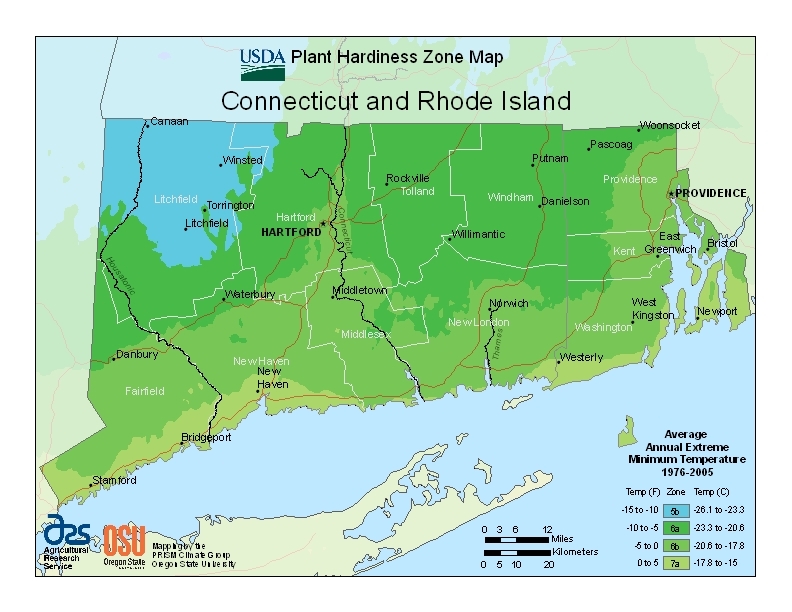 To ensure that homeowners are safe and avoid any power outages, Connecticut Light and Power has a few recommendations regarding tree planting and pruning. First, they remind homeowners never to trim their own trees and always to hire professional arborists for the job. Second, they encourage property owners not to plant tall trees within 25 feet of existing overhead power lines or transformers. Throughout Stamford as well as the rest of the state, many invasive and native pests, diseases and bacteria can do major damage to area trees. According to the Connecticut Tree Protective Association, a few of the most common to keep an eye out for include nun moth, emerald ash borer, bacterial leaf scorch, sudden oak death and pine shoot beetle. 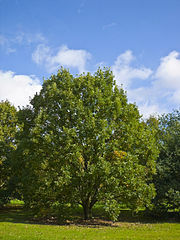 The charter oak, better known as the white oak or scientifically as the Quercus albus, is the official state tree of Connecticut. 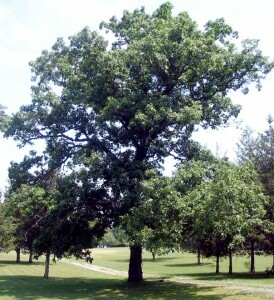 Traditional holds that the state charter of Connecticut was hidden in the hollow of this oak during 1662 to prevent it from getting into the hands of the British. These trees are found throughout the state, and they have a beautiful autumn season when leaves turn shades of orange and yellow. Although Stamford does have some cold winter temperatures and occasional snow, it is still a wonderful place to grow several types of fruit-bearing trees. Anyone willing to nurture trees indoors in the winter will be able to enjoy a greater variety, but the hardy options for year-round outdoor placement include peaches, nectarines and apples. With more than two dozen of Connecticut’s Noble Trees found in Stamford, there are a variety of tall and monumental trees to admire in the area. The tallest in the entire city is the swamp white oak, scientifically known as the Quercus bicolor, that stands at 108 feet in height. The shortest on the list, for contrast, is a 15-foot threadleaf Japanese maple.